SCT6700 series are compatible with Molex Standard .093" pin and Socket connectors. Scondar offers SCT6700 Series, a replacement and cheaper alternative of the Molex .093” pin and socket connectors for 5.03mm pitch and 6.71mm pitch 3191 wire-to-wire connectors. This has an industry standard 2.36mm diameter terminals and can either be incorporated in crimp housings or crimp receptacles carrying up to 14.0 A (9.0 A) with the largest circuit size housings and 17.0 A with high-current and low-force terminal. Molex 6.7mm pitch connector with standard .093” pin and socket is most suitably in medium-power applications. Scondar offers this in a complete package with a male housing, female/receptacle housing, female and male terminal, all manufactured with precision-fitting and durability ensuring accurate mating. Not only is this available in wire-to-wire configurations, but also for wire-to-board configuration with up to 15 circuits. Also, Scondar showcases other features such as positive lock and TPA secondary lock, single row system and spring style mounting ears. The SCT6700 is compatible with AWG 16-20 wire and its capabilities can vary from signal transmission to power delivery. The crimp terminals can be used in plug or receptacle housings, available with tin or gold plating. Molex 6.7mm pitch connector with a standard .093” pin and socket can be used for applications up to 17A. This product is offered with reliable polarization and features easy harness assembly to reduce time and cost during installation. 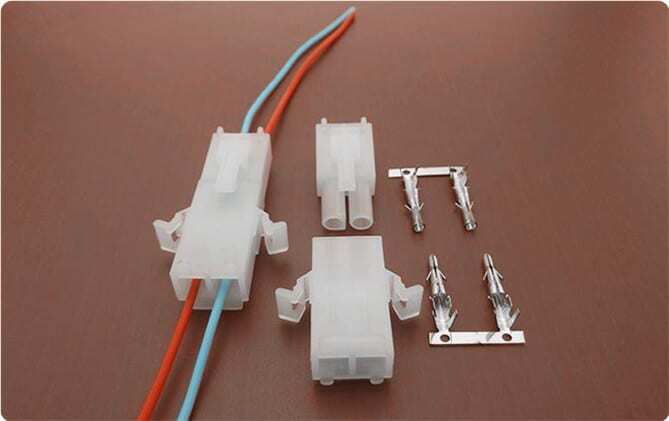 You can expect that your wire-to-wire connector package is undisturbed during the trip and has maintained its vitality even during your production stages, which is why a lot of our customers has raved about our product for both cheaply-priced and, at the same time, resembles the Molex 6.7mm pitch wire-to-wire product with an industry standard .093” pin and socket in performance and quality.